After the joint effort from Young Dave and his spinner Craig Oliver failed miserably, and the broadcasters - that would be all of them - declined to blink, our brave and fearless Prime Minister was left with nowhere to go, and the prospect of the Have I Got News For You “Tub Of Lard” being extracted from the prop store and used to stand in for him. It was the Tories’ own fault. So of course someone else had to be blamed. But who could 10 Downing Street dump on? After all, the broadcasters had acted in concert. But down the road at Victoria, the Telegraph, underscoring its sad and inevitable decline from paper of record to over-sized tabloid, had the headline already written. It was the hated BBC Wot Done It. 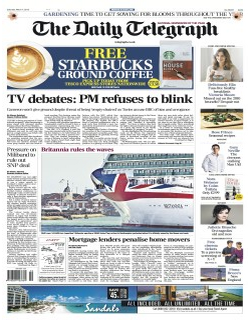 “TV election debates: Tories go to war over BBC's 'institutional arrogance’” declared the headline. Wait, what? You read that right: “Senior Tories are furious with the BBC for attempting to 'dictate' the terms of the TV debates ahead of the General Election”. They are? So why is “dictate” in quotes then? Ah well. “Senior Conservatives are particularly furious with the BBC, which they believe has shown ‘institutional arrogance’ by trying to dictate the terms of the debates … Sue Inglish, the BBC's head of political programmes who is paid more than £150,000 a year, has chaired the broadcasters' panel during the negotiations”. So who are these “senior Tories”? Sadly, there aren’t any: the best the Tel can do is to wheel out Philip Davies to pontificate “The TV broadcasters are gleefully showing their political bias. There is no doubt in my mind that if Ed Miliband didn't want to take part in these debates they wouldn't be taking place”. Yeah, right. If Mil The Younger had pulled out, the Tories, the Tel, the Mail, the Sun, the Times and every right leaning pundit around the Westminster Village would have subjected him to even more abuse and ridicule than they do right now. Davies then goes on to blubber “They are trying to dictate terms to the Prime Minister of this country”, which of course was fine when it was Pa Broon on the receiving end. The only other Tory giving a comment was John Whittingdale, who complained “I think the broadcasters have handled it incredibly badly. For them to believe they have the right to demand leaders just turn up on a given day seems to me wholly unacceptable. It's arrogant … They present the political parties with a fait accompli and then just expect he party leaders to arrive. It's far beyond their competence and responsibility”. But the dates have been known about for several weeks now, and it should be noted that he does not single out the BBC. That angle rests solely on the headline, and the comments of a rent-a-quote who can be relied upon to kick the Corporation, whatever the subject. Not even the Mail has tried to dump on the BBC, and the obedient hackery of the legendarily foul mouthed Paul Dacre needs little prompting to do that. The Tories are screwed. And the Telegraph’s credibility is bust. End of story. [UPDATE 1625 hours: also queuing up to show that its credibility is bust is the Super Soaraway Currant Bun, whose editorial today also suggests that the hated BBC is the culprit for the broadcasters' collective decision not to allow Craig Oliver to piss them about. Under the headline "Behave, Beeb" - as if how the Corporation behaves is down to the sister paper of the now-defunct Screws - readers are told "THE BBC claims to be dedicated to public service ... But the high-handed arrogance it and the other broadcasters have shown over the proposed election debates is a disgrace and is making a mockery of their duty to the public ... 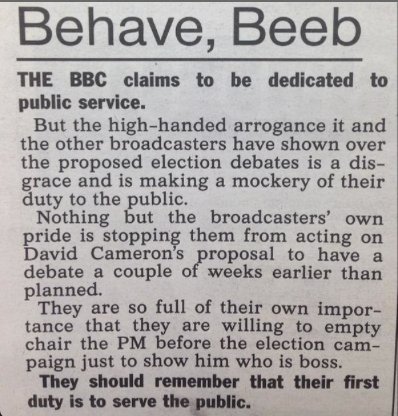 Nothing but the broadcasters' own pride is stopping them from acting on David Cameron's proposal to have a debate a couple of weeks earlier than planned ... they are so full of their own importance that they are willing to empty chair the PM before the election campaign just to show him who is boss ... They should remember that their first duty is to serve the public". And, as Jon Stewart might have said, two things here. One, the broadcasters' "duty to the public" extends to resisting attempts by politicians to manipulate the TV Debates to their own advantage, and two, those broadcasters all agreed not to cave in to Dave. As a proud native of Yorkshire (although like Boycott, Parkinson etc. no longer actually residing there) it is of continual bafflement that a county otherwise proud of its sons and daughters should return such a nincompoop to Westminster. Perhaps it's the only way to stop him pestering the people of Shipley. Another demonstration of why fixed terms dont work. 6 week notice of an election is far more sensible than 5 years, especially when you are a tory party trying to avoid tv debates. With 5 years notice saying the decision is rushed and putting demands on the parties is a joke. Surely not The "likes to be controversial" Philip Davies who helped La Mensch to hijack the HOC Select committee's report into the conduct of the Murdochs at the NOTW? The well known filibuster who with Chope (both apparently landlords) scuppered the "revenge evictions by private landlords" bill? The one who virtually accused the then Trust chairman Lord Patten of lying during another HOC select committee hearing? Pinch of salt time methinks.